The Office of Institutional Effectiveness arranges employee professional development and learning opportunities for the college community to ensure that quality faculty and staff are supporting the college and its mission. Annually, each full-time employee of the college must earn a number of professional development hours (based on their position). According to Policy 3.08 of the Board of Trustees Policies and Procedures Manual, twenty hours are expected of full-time faculty members and administrators, while staff members are required to earn ten. Employees should divide hours between two of the three categories: Personal Improvement, College/Academic Involvement and Community Involvement. 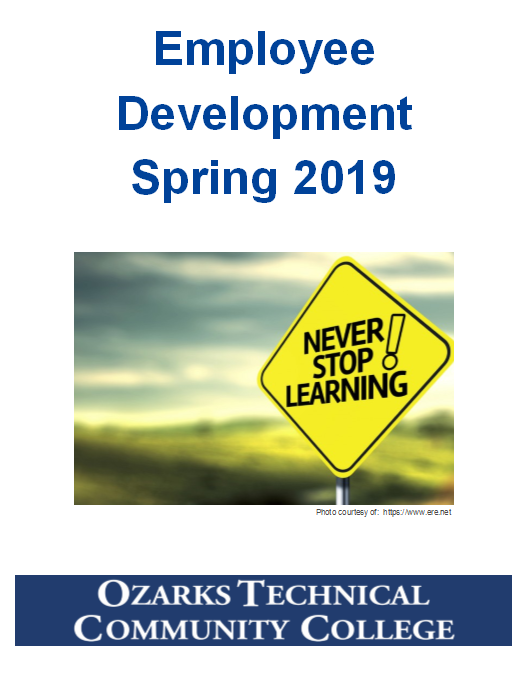 OTC provides several learning opportunities/professional development activities on campus throughout the academic year to help instructors meet the state and college professional development requirements. OTC encourages instructors to participate in industry specific professional development when available if budgets will allow. Employee Learning Opportunities (professional development) are available monthly at the college. How do I keep track of my completed hours? Employees should submit personal development hours to his/her supervisor during evaluations. Faculty hours should follow the academic year (start of fall semester to end of spring semester). Staff and administration hours should follow the calendar year. We are in the process of building the “OTC Professional Development” YouTube channel. Check back every once in a while for new videos. Would you like to facilitate a session? Employee Learning Opportunities address Strategic Initiative One, Goal Three: Encourage professional development opportunities for faculty and staff aligned with institutional priorities and employee feedback.